What's game day without a super bowl of chili? It's long been the traditional fare enjoyed by Super Bowl fans while watching the game. CooksRecipes has quality, kitchen-tested recipes for fan-pleasing chilis that you can count on for successful deliciousness. 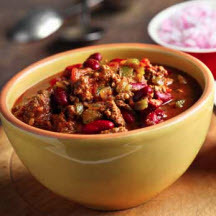 A bowl of this hearty, beer-infused chili will satisfy the hungriest armchair quarterbacks and tailgating fans of the big game. 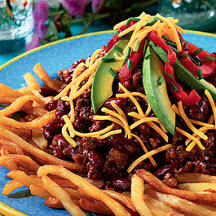 Who doesn't love chili fries? Having friends over to watch the big game? Increase the recipe as needed to feed a crowd. Heart healthy chili made with dark stout beer. 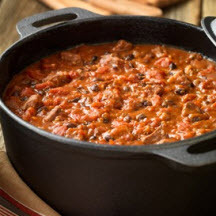 Tip: Like most chili recipes, the flavors are more blended if the chili is served the next day.